real-time needs. With real-time systems, highly accurate orbit propagation is less critical, although we will still need some forward propagation for prediction and planning. The Global Positioning System, also called GPS or Navstar, is a system of navigation satellites funded by the U.S. Department of Defense and intended explicitly to allow position determination by very small receivers anywhere on or near the Earth's surface. Extensive discussions of GPS and its applications, including signal structure and processing algorithms, are provided by Parkinson and Spilker , Leick , Kaplan , and Hofmann-Wellenhof , GPS receivers are now readily available and their use is becoming widespread in airplanes, ships, ground vehicles, and military equipment. The system provides a moderate accuracy signal (50m-100 m) for genera] navigation and a high-accuracy coded signal (15 m) for military applications. Commercial GPS receivers are now available for spacecraft,' and are gaining in popularity in low-Earth orbit [Wertz, 2001; Chory et al., 1986; Anthony, 1992; Parkinson and Gilbert, 1983; Porter and Hite, 1984]. The GPS signal can also be used to solve for the attitude of the vehicle on which the receiver is located. This is done by using multiple GPS antennas which are a known distance apart and which are attached to a rigid element of the vehicle. By measuring the phase difference between the signal from one GPS satellite arriving at two antennas, die GPS receiver serves as an interferometer measuring the angle between the line of sight to the GPS satellite and the line joining the two antennas. The wavelength of the GPS carrier signal is about 20 cm. Therefore, the accuracy of the attitude is limited by both the long wavelength and multi-path effects which cause confusion in the identification of the signal coming directly from the GPS satellite. In practice, spacecraft have been able to achieve on-orbit attitude accuracies on the order of0.3to0.5deg. A number of practical difficulties have prevented GPS receivers from developing substantial operational utility in space for attitude determination. One problem is that multi-path effects can cause difficulties in some geometries and the GPS constellation, by nature, will eventually present most geometrical circumstances to the spacecraft. Orbit determination is an activity which can be done intermittently without harming system performance, but attitude determination must be continuous if we are to avoid a major failure. Consequently, the potential lack of availability of four GPS satellites for even a short period due to either geometrical circumstances or the outage of one or more satellites is a major concern for a spacecraft which depends on GPS for attitude determination. Thus, GPS-based attitude sensors will probably serve principally as backup, or would require backup systems to prevent major anomalies. The global navigation satellite system, GLONASS, is a Russian space-based navigation system that provides 3-D position, velocity determination and time dissemination on a worldwide basis. GLONASS is very similar to GPS. It consists of a 24 satellite constellation at approximately half geosynchronous altitude and provides accuracies very similar to those of GPS. There are a number of manufacturers of GLONASS receivers, some of which are combined GPS/GLONASS receivers. GLONASS is operated by Russia's Ministry of Defense. Like GPS, it was initiated in the mid-1970s with military design goals. Also like GPS, the civilian applications became apparent rapidly and the system is now in use for both civilian and military purposes. While the end results are very similar, the GLONASS signal structure is significantly different than that of GPS. Both GLONASS and GPS are available for use by spacecraft, and many satellite manufacturers are considering the use of either or both systems for onboard determination of position, velocity, time, and sometimes attitude. For further information on GLONASS, see, for example, Leick  and Kaplan . The Space Sextant was developed and flight tested in the late 1970s as a means of autonomous navigation by accurately measuring the angle between a star and the limb of the Moon [Martin Marietta Aerospace, 1977; Booker, 1978]. The Space Sextant provides both orbit and attitude information and can work over a very large regime, including geosynchronous orbit The Space Sextant unit has been flight qualified; however, the need for precise telescope measurements makes the instrument rather heavy and therefore limits its usefulness in many space applications. 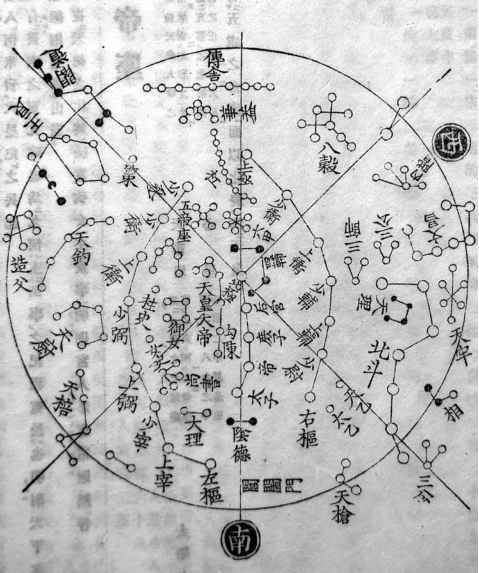 The Microcosm Autonomous Navigation System (MANS) uses observations of the Earth, Sun, and Moon from a single sensor to provide real-time position and attitude data [Tai and Noerdlinger, 1989; Anthony, 1992]. These objects were chosen principally because they can be unambiguously identified with high reliability and low cost and observations can be done with minor modifications to attitude sensors already on most spacecraft The MANS flight software can also make use of, but does not require, data from a GPS receiver, star sensors, gyros, and accelerometers. The addition of other data sources provides added accuracy but is not required by the system. In addition to orbit and attitude, MANS provides ground look point and Sun direction information (even when the Sun is not visible to the sensor). It can work at any attitude and any orbit from LEO to beyond GEO. MANS was flight tested on the TAOS mission launched in 1994 [Hosken and Wertz, 1995]. A number of approaches for orbit and attitude determination have been proposed, based on the interaction of starlight with the Earth's atmosphere [Hummel, 1984]. Specifically, as stars approach the edge of the Earth as seen from the spacecraft, refraction will cause their position relative to other stars to shift, producing an effect which can be measured with considerable accuracy. Theoretical accuracies for such systems are projected to be in the vicinity of 100 m. However, none of these systems has been fully developed for flight as yet. A number of proposals have been made for using satellite crosslinks to provide orbit determination [Chory et al., 1984]. This is of interest because it can be done with crosslink equipment used for intersatellite communication, and, therefore, requires minimal additional hardware. Crosslink tracking has been proposed for a number of constellations, but tends not to be implemented because of several practical problems. One problem is that satellite-to-satellite tracking provides only the relative positions of the satellites in the constellation. This means that if the absolute position is needed for any purpose such as mission planning or data reduction, then an additional system must be provided to establish the orbit relative to the Earth's surface. A second problem, is that the satellites become interdependent, so satellite-to-satellite tracking may not work well for the first satellites or may degrade if a satellite stops working. Therefore, an alternative system not based on satellite-to-satellite tracking is required. If additional systems must be provided, there is less benefit from the satellite-to-satellite tracking. Landmark tracking has also been proposed for orbit determination [Markley, 1981]. This has been established as feasible by using data returned from satellite payloads. However, it has not been used as a normal method for satellite navigation, due in part to the difficulty of establishing automatic, unambiguous identification of landmarks to ensure that tracking accuracy can be maintained in the presence of adverse weather or poor seeing conditions. The combination of Earth and star sensing works similarly to sensing the Earth, Sun, and Moon [Wertz, 2001]. The direction and distance to the Earth are sensed relative to the inertial frame of the fixed stars. This is then used to directly determine the direction and distance to the spacecraft. The Earth and stars are available nearly continuously in any Earth orbit and star identification is becoming less of a problem with the introduction of substantially better computers for space use. Chapter 6 presented relevant A V equations for orbit maintenance and control. This section discusses when orbit control is necessary and what options are available to do it. Section 2.1.2 discusses autonomous orbit maintenance as part of a fully autonomous spacecraft. Most small spacecraft do not require orbit control and have no onboard propulsion. This has the advantage of eliminating one spacecraft subsystem and, therefore, reducing the spacecraft's cost, weight, and complexity. However, once the spacecraft has separated from the launch vehicle or upper stage, no further control of the satellite orbit is possible and the satellite will be subject to drag and orbit decay in low-Earth orbit and to cumulative secular perturbations in all orbits. Usually, this is only acceptable for satellites that will last from 1 to 3 years but may be suitable for longer periods in some cases. For example, the Voyager spacecraft, having left the solar system, will be uncontrolled indefinitely. The only real objective, however, is to maintain communications and, to some degree, sample the interstellar medium. We can also adjust a spacecraft's orbit using other means than onboard propulsion, such as the Orbiter or an orbit-transfer vehicle or tug. For example, with the Space Telescope, the Orbiter is used for both instrument replacement and to return the Telescope to a higher altitude. Each of these is discussed briefly below. An orbit lifetime of more than 1 to 3 years usually demands some type of orbit maintenance or control. Targeting to achieve a particular orbit or location in space is the most common reason for orbit control. Typically, we achieve the orbit objectives with one or two large maneuvers, using several small maneuvers in between or for final adjustments. For example, in transfer to geosynchronous orbit, an initial large maneuver occurs at perigee in low-Earth orbit A second large maneuver follows at apogee near geosynchronous altitude. Finally, several small orbit maneuvers over an extended period place the satellite in its final position. This has been traditionally been done by using large, high-thrust engines for the major maneuvers and smaller engines for orbit adjustments. However, as described in more detail in Sec. 7.5, low-thrust engines can often be used efficiently for large AVs. This normally means smaller, lighter, less-expensive engines and much smaller, simpler control systems. Propulsive maneuvers usually are the largest attitude disturbance on the spacecraft and, therefore, affect the size of the required attitude control system. Small thrusters can reduce the weight, complexity, and cost of other components as well as the propulsion system itself. We often associate major orbit changes with the early phases of a mission, but they can occur throughout the life of the spacecraft. For example, most geosynchronous spacecraft can be shifted so that the longitude of the spacecraft is adjusted to meet changing needs. Spacecraft can also be retargeted to achieve new objectives, such as the retargeting of die ISEE-C spacecraft to rendezvous with Comet Giacobini-Zinner in 1985. The need for maneuvers of this type may arise after the spacecraft has been launched. They are not planned in advance but simply take advantage of existing resources. Finally, as described in Sec. 21.2, it is becoming more critical to use an end-of-life maneuver for spacecraft disposal either in low-Earth orbit or in geosynchronous orbit. These maneuvers are used either to have the spacecraft reenter in a location that is not hazardous, or put the spacecraft in an orbit where it will not harm other spacecraft. While not important during the early years of space exploration, the requirement to maintain a clean space environment will become much more stringent in the future. We must also maintain the orbit to overcome long-term secular perturbations, as described in detail in Chap. 6. All geosynchronous spacecraft require orbit maintenance in the East-West direction to avoid interference and possible collisions with other spacecraft Furthermore, most use orbit maintenance in a North-South direction to maintain a near-zero inclination. In low-Earth orbit, altitude maintenance is used to overcome atmospheric drag and achieve a longer working life. Other orbit types, such as Sun-synchronous or repeating ground track, may also require orbit maintenance. Nearly all constellations require some type of orbit maintenance to prevent collisions between satellites and maintain the constellation pattern over time. In principle, we could use relative stationkeeping in which we maintain the relative positions between satellites but not their absolute position. In practice, however, this will make orbit maintenance more complex and will not save propellant or reduce the number of computations. In a low-Earth orbit constellation with relative orbit maintenance, we would, in principle, maintain all satellites in the constellation to decay at the same rate as the slowest-decaying satellite at any time. But the entire constellation would still decay in this process. Therefore, it would slowly change its altitude and need to be reboosted at some later time. The alternative is absolute stationkeeping, shown in Fig. 11-51. Here, we maintain each spacecraft within a mathematically defined box moving with the constellation pattern. As long as we maintain the constellation's altitude, absolute stationkeeping is just as efficient as relative stationkeeping. All in-track stationkeeping maneuvers are done firing in the direction of motion to put energy taken out by atmospheric drag back into the orbit We put in more or less energy at any given time, depending upon the amount of drag and the atmospheric density, as described in Sec. 8.1.5. Fig. 11-51. 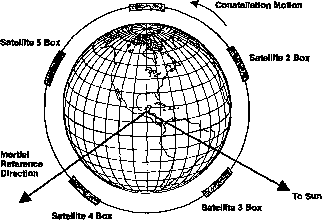 Constellation Stationkeeping Maintains Each Satellite In a "Box" Rotating with the Constellation. Although the perturbative forces are different, constellation maintenance in low-Earth orbit is analogous to stationkeeping in geosynchronous orbit In-track and cross-track orbit maintenance in low-Earth orbit correspond to East-West and North-South stationkeeping, respectively, in geosynchronous orbit Because the forces involved are different, the correspondence is not exact. Altitude maintenance is necessary in low-Earth orbit to overcome the effect of atmospheric drag. In geosyn chronous orbit, this would correspond to maintaining the mean drift rate relative to the surface of the Earth at zero, so the stationkeeping box stays over a fixed location. In low-Earth orbit, this corresponds to maintaining the box at a mathematically fixed position in the constellation. Traditionally, orbit maintenance and control are executed from the ground. The required orbit adjustment will be computed at the ground station, and a series of commands will be generated which are uploaded to the spacecraft and then downlinked for verification. Finally, the ground station sends a command to execute the control commands, and the spacecraft carries them out based on an onboard clock. This sequence protects the spacecraft against communications errors and allows maneuvers when the spacecraft is out of sight of the ground station. The spacecraft is often out of sight because orbit maneuvers are usually 180 deg out of phase from the desired result For example, in landing on the Moon, the principal burns bring the spacecraft down to the Earth-facing side of the Moon and take the returning astronauts back to Earth. Both burns occur on the far side of the Moon, entirely out of sight of the Earth. In normal geosynchronous stationkeeping the spacecraft is allowed to drift to one side of the stationkeeping box. A maneuver then changes its velocity so it will drift across the box and back before needing another maneuver. This is similar to keeping a ball in the air by continuously hitting it upward with a paddle. The main reason for this sequence is that it maximizes the time interval between maneuvers and, therefore, minimizes the amount of ground operations, which carry the potential for communications errors or command mistakes. In the past there was no realistic alternative to orbit control from the ground. Now, however, autonomous navigation systems have made autonomous orbit maintenance possible, economical, and safe. Autonomous orbit maintenance drives down the cost and risk of missions by having a major part of the day-to-day operations on board the spacecraft As described in Sec. 2.1.2, autonomous orbit maintenance is a key component in a fully autonomous spacecraft bus, which can further reduce mission costs. (For further discussion of autonomous orbit control, see Wertz [1996, 2001], Wertz, et al. , KOnigsmann, et al. , Collins, et al. , or Glickman .) Microcosm has developed a commercial, autonomous Orbit Control Kit flight software system scheduled for flight validation on UoSAT-12 in 1999. This and other approaches are also scheduled to be flight tested later on EO-1 which is intended to do formation flying with LandSat-7. Orbit and attitude control are analogous, with several important differences. Typically, we must control attitude moderately often or continuously if we are to avoid serious consequences. A satellite that loses attitude control will usually tumble and then lose the payload function, power on the solar arrays, and contact with the ground. It also may point sensitive instruments at the Sun or have substantial thermal problems. Even a brief attitude control failure can destroy the mission. In contrast orbit control maneuvers occur infrequently, and any computer that can do autonomous navigation will easily accommodate the necessary additional computations. As long as we control the orbit with low-thrust systems (Sees. 7.5,17.4), a short-term failure will cause no damage. Gravity takes care of short-term orbit control very well. If the orbit-control system fails, the ground or the onboard system will determine that the satellite is slowly drifting from its assigned slot and a warning can be issued with adequate time to fix the problem or implement a back-up before adverse consequences occur. With autonomous orbit maintenance we can optimize characteristics other than the time between maneuvers, such as the size of the control box. Just as we would not ordinarily implement attitude control to minimize the number of commands sent to the momentum wheel, we do not have to minimize the number of thruster firings so long as the duty cycle is within the range of the thrusters and the thruster pulses are long enough to achieve high efficiency. Ordinarily using many short pulses is not a problem, as thrusters are frequently used for attitude control and small thrusters have lifetimes far in excess of the required number of on-off cycles. For some missions, autonomous orbit control is required simply because of the nature of the mission itself. This is the case for planetary flybys or a mission to the far side of the Moon in which either the spacecraft is out of contact orthe communications delays are too long for normal ground control. Generally, ground stations do the orbit-control computations and upload them to the spacecraft for execution at a later time. This is a semi-autonomous approach which can meet mission requirements while maintaining ground control. In geosynchronous stationkeeping, the main reason for autonomous orbit maintenance is to reduce operations cost and risk, rather than a specific technical requirement. * For a constellation at any altitude, the overall process of orbit determination and control represents a major operational cost. It also represents a significant risk element in which any operational error or failure of the ground system could damage or destroy the constellation. The orbit maintenance operation is necessarily carried out on board the spacecraft by firing thrusters. Performing the control computations on board the spacecraft can reduce both cost and risk. First, it eliminates the potential for operator error in a very repetitive function. Second, it reduces communication errors or failures frequently associated with operational activities. The argument has been made that autonomous orbit control is a range-safety concern because having a spacecraft adjust its orbit without operator oversight could endanger other spacecraft or people. This is a reasonable concern for firing high-thrust, large A V engines, but it is not a problem for low-thrust maintenance. A watchdog timer can easily limit the propulsive bum time to keep burns small. Even if the watchdog system fails, the amount of propel!ant in most low-thrust systems is too low to endanger other space systems or people on the ground. The principal reason for not undertaking autonomous orbit maintenance and control for future missions is tradition. It has not been done that way in the past, and there is a very strong desire in expensive space missions to maintain those procedures that have worked previously. A mechanism for overcoming this potential risk is supervised autonomy in which orbit maintenance maneuvers are computed on board the spacecraft and verification from the ground is required before they are executed. This allows mission personnel to gain confidence in the onboard computations before permitting fully autonomous operation. * A technical requirement for autonomous orbit maintenance can arise in geosynchronous stationkeeping when there is a desire to place additional satellites in a narrow orbit slot In this case, autonomous orbit maintenance is needed to reduce the size of the orbit-control dead-band, which would be impractical if we had to do frequent commanding from the ground. done at the ground station and then sent to the spacecraft for execution. This has the advantage of maintaining some characteristics of traditional orbit maintenance and also minimizes the amount of hardware on board the spacecraft Unfortunately, this approach can add significant complexity and risk to the mission. If the navigation data is obtained on board the spacecraft, it would need to be communicated to the ground for processing. Then, the results and commands would go to the spacecraft and be verified for later execution. This makes the process much more complex and increases the potential for communications errors and transmitting the wrong data to the wrong spacecraft. Most likely, these disadvantages would outweigh any advantage of doing the small amount of command processing on the ground. If the spacecraft has enough computing power on board, a reasonable alternative might be to compute the orbit control, on board the spacecraft and send it to the ground for verification and approval before actually executing the command. This allows full ground override. It also allows the system to use an on-orbit process with less cost and higher reliability, whenever operators are confident that the system is working smoothly. If the spacecraft navigation is done with the traditional approach of tracking from the ground, doing the commanding from the ground and uploading commands to the spacecraft is an efficient alternative and minimizes the overall communication problem. In this case, the traditional cost and complexity of orbit maintenance from the ground remain, although it may be possible to reduce this somewhat with more automation. Autonomous navigation and orbit control can significantly reduce the cost of space operations. For most space missions, this is a major cost It should also reduce risk because there are fewer failure modes than with operator-driven or ground-based systems. For modem spacecraft almost no one would recommend doing attitude determination and control from the ground, even though this is a more complex task with more serious adverse consequences than orbit control. The main argument against autonomous orbit determination and control is tradition—we have not done it that way in the past and, therefore, should not do it in the future. The implementation of a purely ground-based guidance and navigation system is both expensive and straightforward. This is the traditional approach, and is described in detail in Chap. 14. The process is well established for geosynchronous spacecraft, low-Earth orbit spacecraft and interplanetary missions. The main reason for considering autonomous guidance and navigation is to reduce mission cost and risk. But we can also extend mission life, put more spacecraft into a geosynchronous slot or undertake missions which we could not realistically do without some autonomy. TABLE 11-67. Size, Weight and Power of Alternative Autonomous Navigation Systems. All systems are evolving, so size, weight and power will probably decrease In the future.